Imagine you are walking across your campus. As you pass the student center, you see a couple of people who have set up at a table outside, and they’re passing out information about the student honor society. Open windows in the music building share the sounds of someone practicing the piano in the art studio. Upon entering your class building, you are greeted by student-made posters illustrating various phases of the process of cell division. An open class door allows you to watch a young man in a lab coat and protective gear pour liquid nitrogen over items in a tray while the rest of his classmates look on with great interest. Your own instructor is setting up the computer screen at the front of your class when you walk in, loading up the Powerpoint that he plans to use for the day. All of these are examples of presentations, and it’s very likely that you’ll be asked to participate in similar activities during your college career. Presenting, whether face-to-face or online, is a skill you will hone as a college student in preparation for your future career. Presentations can take many forms and potentially serve many purposes. When reading the definitions below, keep in mind that many presentations often combine several elements into a hybrid form. You may have to pick and choose what will work best for you depending on the instructor and the course. Let’s start with the different genres or types of presentations. Unlike informative presentations, persuasive presentations ask that you not only form an opinion about your subject but also convince your audience to come around to your point of view. These presentations often involve research, too, and the findings of your research will be used to bolster the persuasive case you’re making. You may be asked to do a “Teaching Presentation,” which will require you to specialize in one topic of the course and give your fellow classmates instruction about it. In short, you become the teacher of a subject. Often your presentation will be the only time that this subject is covered in the class, so you will be responsible for making sure that you provide clear, detailed, and relevant information about it. You may also be asked to provide questions on the subject to be included in a quiz or test. These action-based presentations typically model some behavior or subject matter that has been introduced previously in the class. Unlike the Lesson Delivery presentation, a demonstration adds a level of performance in which you show and tell the the audience what you know. You might perform the demonstration yourself, as a way of illustrating the concept or procedure, or you might provide classmates with instructions and guidance as they do it themselves. Poster presentations should convey all the information on a subject necessary for a viewer to consider on her own. They often consist of short, punchy wording accompanied by strong visuals—graphs, charts, images, and/or illustrations. Posters frequently require research to prepare, and they allow for some creativity in design. Depending on the assignment, your poster may be part of a gallery of poster presentations with your classmates. Your poster has to communicate everything that is important without you being there to explain it to your audience. Similar to poster presentations, online presentations are generally asynchronous—meaning they don’t require you to be present at the same time as your viewer. They often serve similar purposes as poster presentations, but due to the online format, they allow for more interactive possibilities, such as sharing a pertinent video or animated graph. Your online presentation must stand alone to teach your audience everything they need to know. You may be asked to present as an individual or as part of a group. Individual presentations put all of the responsibility for preparation, research, and delivery on you. You rightfully take all the credit for the final product you produce. Group presentations, in contrast, often involve more complicated tasks and therefore require more participants to make them. Your instructor may make suggestions about how the work should be divided, or the group may delegate tasks internally. Grades may be assigned equally to everyone in the group, though many instructors assign individual grades based on some participation-level factor to inspire each member to pull his or her own weight. 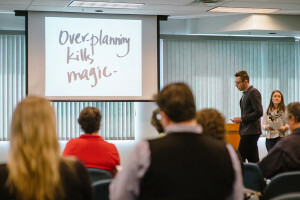 Presentation assignments are often open to creative interpretation, which gives you a lot of room to explore new techniques and add a personal touch to the task. Now that you’ve learned a bit about the various types of presentations, it’s helpful to turn to another important part of presenting: the audience. Like reading and writing, presenting is a form of communication. Whether you’re presenting information, giving a demonstration, creating a poster, or trying to change people’s minds, your goal is to get your message across to your audience. For that reason, it’s important to remember that they may not interpret the information you are presenting exactly as you have. It’s your job as a presenter to explain your ideas using specific details, succinct and clear wording (avoid jargon), vivid descriptions, and meaningful images. As you organize your presentation, keeping this imaginary audience in mind can help you gauge how much background information and context to provide. Perhaps you’ve heard the phrase “Death by PowerPoint” to explain that all-too-familiar feeling of being slowly bored to death by a thoughtless presenter who’s droning on and on about boring slide after boring slide. If you’d like to know what the experience is about, and you have time for a laugh, watch the following video, starring stand-up comedian Don McMillan. McMillan pokes fun at bad presentations, but he has some very sound advice about what not to do. Choosing a font that is too small. The person in the very back of the room should be able to see the same thing as the person in the front of the room. Putting too many words on a slide. Remember it’s called PowerPoint, not PowerParagraph! Keep your bullet points clear and succinct. Having spelling errors. Have somebody proofread your slides. Any typos will detract from your presentation. Choosing distracting colors that make it hard to read the information. PowerPoint gives you a lot of color choices in their design templates. The ideas in your brilliant presentation will be lost if your audience is struggling to read the content. Selecting images or visuals that do not clearly align with the content. For instance, a cute photo of your cat may look lovely up on the screen, but if it doesn’t connect to your topic, it’s just fluff that detracts from your message. Every slide counts, so make sure the visuals support your message. Once you’ve put together your presentation and have an idea of the audience that will hear and see it, it’s time to deal with the “nerves” that can accompany the performance part of the presentation. let’s consider some strategies for reducing anxiety about the presentation. Let’s turn to a final list of pointers for the “performance” part of the presentation, when you actually present your plan to an audience. You’ve worked hard as the owner of this presentation, so have confidence in your work. It’s tough to remember this when you’re nervous, but you’re the person who knows the most about your presentations. The following activity can help you get there. As you plan for your presentation, it’s helpful to reflect on the challenges you may face when you present to your audience. Jot down a quick list of strengths and weaknesses. Be honest! Now that you have an honest reflection of those strengths and weakness, it’s time to practice. Ask a friend or family member to watch you present. Request that they be honest with you and give constructive criticism about the strengths and weaknesses of your presentation. Have them jot down quick notes. After the practice presentation, compare notes with the friend or family member. Compare and contrast how you felt about the quality of your presentation with the feedback you received. Use this information to help improve your presentation delivery. What if you don’t have anyone available to practice your presentation? Record yourself using your phone or your laptop. It can be very difficult to listen to yourself, but it’s always enlightening to watch and/or listen to yourself present. Practicing your presentation will help you build confidence and reduce anxiety prior to and during your presentation. Remember the sage advice of Oscar Wilde: “Be yourself. Everyone else is taken.” Good luck!